Edward Pickering, President of the Toronto Symphony, and Hugh Lawson, Chairman, Massey Hall Board of Trustees, announce plans to build a new concert hall. Captains of Canadian industry are recruited to help raise $10 million for the new hall, the largest cultural campaign in Canada. Four Honourary Chairmen are named: Prime Minister Pierre Trudeau, Premier William Davis, Metro Chairman Paul Godfrey, and Mayor David Crombie. Lieutenant-Governor Pauline McGibbon climbs into the cab of a giant construction shovel to break ground for construction on the New Massey Hall, situated on a 2.5 acre site at King and Simcoe Streets. The architects are Arthur Erickson and Mather and Haldenby. Violinist Itzhak Perlman acts as a special advisor to the architects to ensure accessibility at all levels for disabled performers and patrons. Final construction funding is obtained from the three orders of government, corporations, foundations and through a public seat endowment program where every music lover is asked to buy a seat for $1,000. Total price tag of the new hall: $44 million. The Board of Trustees announces that the name of the new concert hall will be Roy Thomson Hall, thanks to the $4.5 million donation from the family of the late Roy Thomson. Roy Thomson Hall's inaugural gala concert is with the Toronto Symphony Orchestra and the Toronto Mendelssohn Choir. Opening celebrations continue with performances by Lois Marshall, Anne Murray, Gordon Lightfoot, the Canadian Opera Company, Karen Kain and Frank Augustyn, the Canadian Brass, Toronto Consort and the Canadian Children's Opera Chorus. Lovers of singing hear vocal superstars Janet Baker, Kiri Te Kanawa, Elly Ameling, Leontyne Price, Nicolai Gedda, Jessye Norman, and Maureen Forrester. The Hall gains a national profile on CBC Stereo's "Roy Thomson Hall Presents" every Sunday afternoon, broadcasting 35 concerts nationally, to an audience equal to Canadian listeners of the popular Metropolitan Opera broadcasts. Following significant financial losses, President Edward Pickering announces changes in programming—a more diverse and cosmopolitan season from classical and jazz to pop, world music and dance in order to broaden the audience. HRH Queen Elizabeth II visits the Hall and attends a Royal Gala performance of the Toronto Symphony Orchestra. The Hall is centre stage for the International Bach Competition and Bach 300 Festival—a festival celebrating 300 years since Johann Sebastian Bach's birth. Canadian pianist Angela Hewitt wins 1st prize and earns a Deutsche Grammophon recording contract and a year of concert engagements around the world. Walter Homburger, Managing Director of the Toronto Symphony Orchestra for 25 years is given a huge farewell concert entitled "The Great Gathering." The "greats" include Isaac Stern, Jean-Pierre Rampal, Yo-Yo Ma, Seiji Ozawa, Itzhak Perlman, Maureen Forrester, Pinchas Zuckerman and the "gathering" raised $2.3 million for the TSO Endowment Fund. The Closing Ceremonies of the International Economic Summit takes place at Roy Thomson Hall with the G7 leaders in attendance. Brian Mulroney, Margaret Thatcher, Helmut Kohl, François Mitterrand, Ciriaco de Mita, Noboru Takeshita, Jacques Delors, and Ronald Reagan. 71 year-old Leonard Bernstein conducts the Vienna Philharmonic as part of The Great Orchestra Series. It would be his one and only Roy Thomson Hall appearance; he dies two years later. The Toronto International Film Festival (TIFF) begins their annual Gala Screenings at Roy Thomson Hall. Welcoming international film stars and directors for world premieres of acclaimed Oscar Winning films including The King’s Speech, Slumdog Millionaire, Black Swan. Roy Thomson Hall rings in the New Year with style, presenting a spectacular Millennium Opera Gala featuring 15 world-renowned Canadian vocalists, members of the Toronto Symphony Orchestra and the Toronto Mendelssohn Choir. The event was, what the Toronto Star called, "a celebration of Canadian musical accomplishment that took us bounding into the future." Roy Thomson Hall unveils plans for a $20 million enhancement project. Roy Thomson Hall engages Russell Johnson, principal designer at Artec Consultants and one of the world's foremost acousticians, to plan and supervise the acoustical reengineering of the auditorium. Canadian architectural design firm Kuwabara Payne McKenna Blumberg's objective is to ensure seamless and elegant integration of the acoustical modifications with the functional and aesthetic enhancements to the Hall. The project stretches over two years and includes a 22-week shutdown of the Hall, from March 11 to August 9, 2002. After seven years of planning, and an additional $4 million from the Government of Ontario and Canada sees the $24 million Roy Thomson Hall Acoustical Enhancement Project become a reality. The Hall reopens to audience and critical acclaim. RTH was the gala venue for the live-to-air CBC Television and CBC Newsworld special titled The Golden Jubilee Gala which featured members of the Toronto Symphony Orchestra, the Toronto Mendelssohn Choir, Ginette Reno, Evelyn Hart and Rex Harrington, The Tragically Hip and the Oscar Peterson Quartet to name a few. The event was held in the presence of Her Majesty Queen Elizabeth II and His Royal Highness The Duke of Edinburgh along with many other dignitaries. Peter Oundjian was appointed the Music Director of the Toronto Symphony Orchestra, and assumed the post in 2004. The official opening of the newly constructed donor lounge is held with a ceremony honouring past and current donors. The Lexus Lounge (currently The Marquee Club and Maestro’s Club Lounge) was awarded Best of Show in the "Canadian Interiors' 2004 Best of Canada Competition." The Lounge was designed by KPMB Architects and built by Dalton Construction. It is located in the southeast corner of the lobby, in the existing footprint of the second storey of the original rehearsal hall. The award-winning documentary film Five Days in September: The Rebirth of an Orchestra is released. The film records the first days of Oundjian's first season as the TSO's music director. Sir Paul McCartney performs at Roy Thomson Hall as part of a gala event debuting the Lexus 2006 model vehicles. At the 23rd Annual Canadian Music Industry Awards, Roy Thomson Hall was the proud winner of The Massey Hall Performing Arts Centre of the Year Award. Previously known as the "Performing Arts Centre of the Year Award", this year the award was renamed "The Massey Hall Performing Arts Centre of the Year" Award in honour of the fact that Massey Hall has won in this category seven times in the previous 10 years. Some of the world’s greatest artists, including Canadians Diana Krall and Measha Brueggergosman, paid tribute to the legendary pianist Oscar Peterson, in a memorial concert at Roy Thomson Hall. The event, which was broadcast live through major media, was free to the public and featured video, musical and spoken tributes to the legendary musician. Roy Thomson Hall is chosen as venue for the Munk Debates. The first debate, “Be it Resolved, Religion is a Force for Good in the World,” is held between former British Prime Minister Tony Blair and author Christopher Hitchens. The state funeral for Canadian New Democratic Party leader and Leader of the Official Opposition, Jack Layton, is held at Roy Thomson Hall. The ceremony, which was broadcast live across major news outlets, was attended by numerous dignitaries, and welcomed thousands who gathered to fill both the Hall and neighbouring park, David Pecault Square. The Honourable David C. Onley, Lieutenant Governor of Ontario, hosts a DIAMOND JUBILEE GALA to present Queen Elizabeth II Diamond Jubilee medals to members of the Order of Canada residing in Ontario, members of the Order of Ontario and other deserving individuals. The medals honour the contributions and achievements made by Canadians from all sectors of society. The evening included performances by Tafelmusik, Michael Burgess, Liona Boyd, Bruce Cockburn and Tom Cochrane. "Roy Thomson Hall: A Portrait" (Dundurn) is published. The book , written by William Littler and John Terauds, traces the first 30 years of what was initially known as "New Massey Hall." 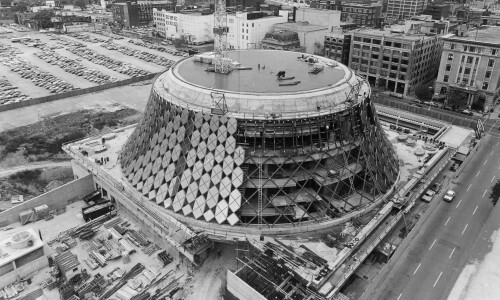 Arthur Erickson's iconic design quickly became a symbol of a vibrant city emerging on the world stage. Roy Thomson Hall debuts the addition of The American Express Lounge. Designed by Marianne McKenna, a founding partner of KPMB Architects, the sleek 900-square-foot wine lounge is an elegant space offering American Express cardholders access to some of the finest wines and spirits currently available. Roy Thomson Hall North Court Patio is opened to the public with a new public access walkway located off David Pecaut Square. The glass doorway and extension was designed by KPMB Architects. Removable stone staging and patron space is also installed expanding the patios capacity from 400 to more than 650, accommodating a free concert series Live on the Patio multiple times each week throughout the summer months.